Shopping for underwire bras is sooooo frustrating... don't you agree? It's up there with jeans and bathing suits. Unfortunately, bras are also up there with jeans and bathings suits in terms of the most intimidating things to sew. There's a bit of a hump to get over, both with the specialized notions and project-specific sewing know-how. Well, guess what... I made a bra! How cool is that? The catalyst that finally made the chemistry of bra-making come together was making my Sophie swimsuit. Making the Sophie with full support is basically like making a foam cup, underwire bra, and it gave me courage to go ahead and make a full-on bra. In fact, I entertained the notion of just making the Sophie bikini as a bra-- and I may just do that sometime in the future. Why not-- it's basically a bra, and the shape of the cup fits me really well. However, in the spirit of embracing bra-making whole-heartedly, I chose a bra pattern that looks strikingly like the Sophie... Makebra 03. It's a foam cup balconette bra with a full band. 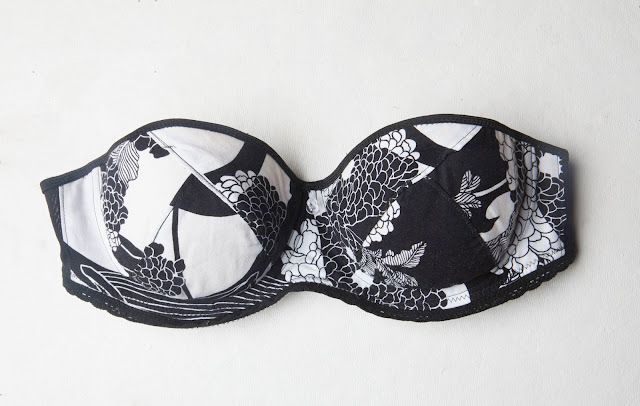 I've been weighing bra patterns for years, and some of my favorite bloggers have made gorgeous bras with this pattern, in particular Tasia's floral one and Carolyn's Film Noir set. (Makebra 03 is very, very similar to the discontinued Makebra 2610). --Don't bother trying to figure out what underwire to use with your chosen size. Instead, find an underwire that fits your breast "root" and choose the size you make based on the underwire you want to use. Hopefully this size will be one of the 3 you received with the "multisize" pattern. Adjust the band and volume of the cup accordingly (either by fitting or grading between sizes). 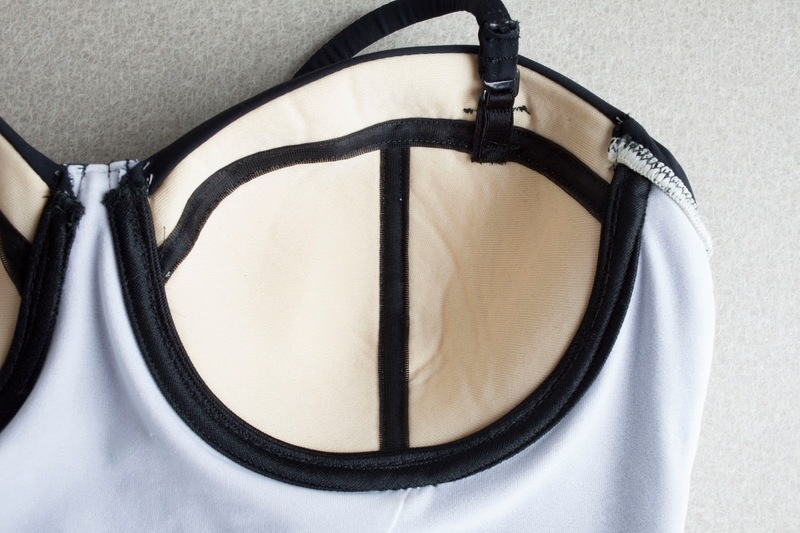 --The bra band is drafted to be made in a stretch fabric. The cup cover can be any fabric, since the foam lining controls the stretch. A small piece of bra lining or "15 dernier" bra-making fabric (or any lightweight, non-stretch fabric) is ideal for the bridge. --The bottom band requires 1/2 inch plush elastic. The top of the bra is finished with foldover elastic (although see Tasia's version for how she used non-foldover plush elastic, or study Carolyn's for possible ideas on a clean non-elastic finish to the top of the cup). Okay, so onto the details! Makebra patterns are not multi-size. Instead, you have a choice of buying one size, or buying a "multi-size" pattern which means you three sizes-- one that you choose, then the cup size larger and smaller. I measured about 5 times before choosing the 85B based on my measurements and their charts. Their pattern delivery is not instantaneous, either... I ordered on Saturday night, and got my pattern on Monday morning. They clearly state this on their website and it makes sense since this method of distribution is probably difficult to automate, but I thought I'd mention it, since instant gratification is something we've come to expect of PDF patterns. 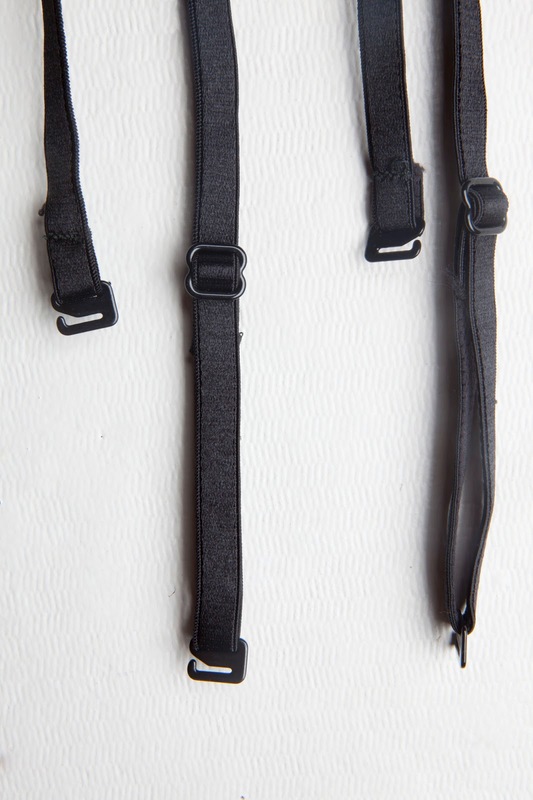 I don't even want to admit how much time I spent agonizing over underwires-- as far as I can tell, there is no clear standardization-- the best you can do is make a good guess based on the dimensions posted by sellers, then buy the size above and below the size you think you are. Frustratingly, the Makebra patterns specify underwire sizes only for their proprietary underwires, and they don't seem to post the dimensions of their underwires. However, in ordering the supplies for my Sophie, I had also collected several samples of different underwires, in different sizes, so I ended up figuring out what underwire to use based on which one lined up with the pattern. Actually, I decided to flip this equation... I chose the size that I wanted to make based on the underwire that fit best. I can't say that I fully understand the making of underwire bras, but in my reading about them, it seemed like finding an underwire that was a good fit was key to a good fit on the bra. If I think about all of the failed underwire bras I've worn in the past, it is quite clear that an underwire that is too small will pinch and cut into the breast, and an underwire that is too large cuts into the underarm. The size of a band is easy to adjust if you are sewing your own bras... and even the volume of the cup is a pretty simple adjustment. The underwires I used for my Sophie, size 38 from Bra-Makers-Supply or Tailor Made Shop, were a good fit... I had bought a 36 and a 40 and the 38 clearly seemed to be the best fit. I had also bought the UW-920 38 at Sew Sassy (as well as larger and smaller wires), which was a very similar fit to the Bra-Makers Supply wires, but more of a "U" shape. The "Flexlite" UW927-12 from Sew Sassy was also a good fit for me, but the arms of the "U" are longer, and I'd almost certainly have to cut the wire to fit it into a bra. Which is a possibility to try in the future... these wires might be nice, they are thinner and lighter than the other wires. In addition, I also bought the UW-42 from Sew Sassy, and they are, as they say, quite similar to the UW-920, but a bit thicker and heavier. I guess that this would be obvious to anyone that really understands bra sizing, but the 85 A, B, and C require different underwires. This was dramatically clear when I printed them out and compared them. So, based on the underwires that seemed to fit best, I decided to make size 85C. I made a muslin following Cloth Habit's suggestions on making a muslin for a bra. I even inserted the underwires and the basted the hook and eyes into place, and skipped the elastic, as suggested. All seemed good, so I proceeded, full-steam ahead! Unfortunately, when I was nearly done and had the elastic in place, it became clear to me that the fit of the cups wasn't going to work. The band and the underwires seemed just about right, but the cups just had far too much volume at the top of the cup-- there was massive gaping up there.At this point, I had the choice of bagging the project and starting over, or unpicking and trying to make this one work. I went with the latter choice, unpicking the foldover elastic at the top of the cup, then unpicking the seams of the cups, both the foam and the covers. I then pared away quite a bit... I took out about 2 inches at the top of the cup! I sewed the cup together, replaced the foldover elastic, tried it on again-- better, but still not enough! So I took it apart AGAIN and pared more away from the top and center of the cups. Before sewing the cups together for the final time, I traced the shape of my new foam cup pieces onto my pattern. The center and tops of the new cup pieces were similar in size to the A cup. It occurs to me that "grading" the bra cup might be an option with future bra patterns. In fitting this bra, it also occurs to me that this might be the key to my lack of success with shopping for underwire bras... perhaps I have a larger chest and breast "root" but less breast volume? Therefore I would tend to either buy bras that fit the volume of my breasts but had underwires that pinched, or bought underwires that fit and had baggy cups. It's been years since I even tried to buy an underwire bra, but this seems to fit my memory of failed bras in years past. The other problem I had to solve was a more straightforward one... I had failed to note that the pattern required 1/2 inch plush band elastic. I had 3/4 inch and 1 inch band elastic. When it came time to apply the band elastic, it became quite clear that anything larger than 1/2 inch just was not going to fit under the underwires. I promptly placed an order for 1/2 inch band elastic, but was too impatient to wait for it to arrive, so I came up with a solution... use 3/4 inch ugly white band elastic and allow it to hang off the edge. Cover the unsightly edge with 3/8 inch stretch lace from my stash. Problem solved! Not so pretty from the inside though. It would have been less unsightly if I had thought to use white thread in my bobbin. Another change I made to the pattern was to make the front of the band from a non-stretch woven-- the same medium weight cotton woven fabric I used to cover my cups. I'm sure you recognize it, I've used it on several other projects. Since the back side of my fabric was not so pretty, I also lined this part of the band in the same fabric. Just past the cups, I added a seam so that I could add a band in a stretch fabric. 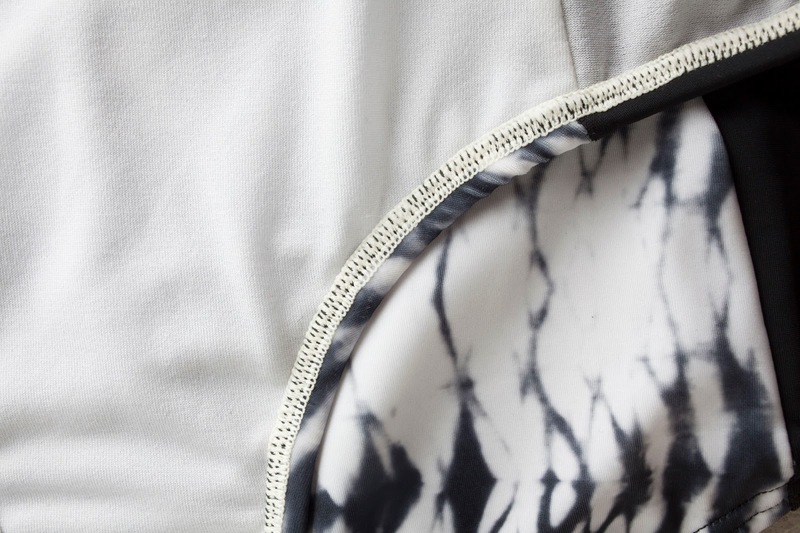 Since I had a double-layered front, it was easy to hide the seam allowance of the added seam. I made the stretch part of the band from a single layer of a mesh that was in my stash which had stretch but was rather firm-- it was labeled "corset mesh" when I bought it. I have another mesh in my stash that is labeled "powernet" but seems VERY stretchy and not very durable to me. I might try using a double layer of this in the future. Since this was turning out to be a very "stable" bra, I decided to make the straps removable so that I could use the bra strapless! The strapless possibilities of this bra are something that remain to be tested... I think that it would be easy to draft a "longline" band, and the extra support of this band might make this pattern into a very functional strapless bra. The true test of any bra is in the wearing! I can't tell you how many bras I've bought that have felt great in the store but have never been worn again after the first full day of wear. After having worn it for a total of about 3 days (not consecutively), I can say that fortunately, this one does not fall into that dismal category. I also can't say it is the most comfortable bra I've ever worn. It fits well, but the band is tolerable but not super comfortable for a full-day's wear. Uncomfortable bra bands are a common problem for me in bras, and "tolerable" is doing pretty well. I have some ideas on things that might improve the comfort for me in future bras. First-- I could follow the instructions and actually make the full band of the bra out of a soft, stretchy jersey fabric with a high-quality 1/2 inch plush elastic. Another idea comes from some of my favorite RTW (non underwire) bras-- I could enclose the band elastic in the band. I actually think this might be pretty awesome in terms of comfort, and quite doable. Also on my list of things to try is one of the lighter weight underwires... these might remove some of the pressure against the band. It also occurs to me that perhaps I should try one of the tempting non-underwire bras that are out there. I really think that my chest can use the support of true underwire cups, but I might be able to get away with a non underwire, at least sometimes. Overall, I think it is a very successful first bra. I feel amazing wearing it, it is much more supportive than anything I currently own, and I can totally see how making lingerie could be addictive! There is definitely room for improvement, which has me scheming about future bras! This is the hottest summer I can remember! When I'm home with the kids, we swim every day... and all of our vacation plans this summer involve beaches. When Heather at Closet Case Files announced her new Sophie Swimsuit Pattern earlier this summer, I knew I had to sew it up in a hurry! A swimsuit with built in support... sign me up for that. I don't have a huge bust, but my post-baby chest definitely needs extra support and shaping. The Closet Case Files Bombshell swimsuit is the suit that I reach for most often in my swimming wardrobe, in part because I hacked it and created support by sewing an old bra into the front of the suit. This works pretty well, but it's not nearly as elegant as having a built in foam cup and underwire bra. That's top notch support! Of course, this means you basically are learning to make a bra... which is something I was intending to do in the near future anyway. I also love the lines of the Sophie... totally ideal for fun combinations of color and patterns, and perfect for creating figure enhancing illusions. After measuring and re-measuring, I decided to make a size 10 bust, with a number 4 cup. I graded out to a 12 at the hips, but kept the length of the 10. I didn't make a muslin, although I did follow the suggestion to sew the foam cups first and try them on before cutting the rest of the pattern out. I looked all over the place for the perfect fabric, and finally settled on a black and white shibori-look print from Spandex World. The black fabric is their black milliskin. The lining is basic white swimsuit lining from my stash, I can't remember where I originally got it from. White lining makes the colors of the spandex more intense when the suit is wet. Once I had collected all of the notions and fabrics (more on that later! ), the swimsuit came together quickly. I've sewn many swimsuits before, so I didn't need much hand-holding, and the instructions that came with the pattern were excellent. I didn't purchase the video tutorial, although I'm sure it is great. I'd really like to see it, just for fun, but I did fine without it. If you are new to swimsuit making, the sew-along for the Bombshell is also a great resource for basic techniques. I found making the foam bra to be surprisingly easy and satisfying. At first I wasn't careful about which piece needed to go where, and I ended up sewing the wrong pieces together and having to seam rip it and start over. But once I got things in the right order, they came together nicely. I used strips of bra lining folded in thirds to hide and reinforce the seams on the foam cups, as shown in Cloth Habits tutorial on making foam bra cups. I didn't have trouble sewing in the underwire casing until it came to the second line of top stitching, which is supposed to be a scant 1/4 inch from your first line of stitching so that you catch the edge of the casing, which you can't see since you need to top stitch from the outside. On one cup, I ended up having to redo a small section, and on the other, I hand stitched a small section that didn't get properly caught. I sewed most seams on my serger with wooly nylon in the loopers. I did quite a bit of switching back and forth between white and black thread, since I didn't want white to show through the seams of the black panels, and my lining was white. When sewing the elastic to the leg holes and back of the swimsuit, I serged the elastic into place with the serger knife retracted, then after folding the elastic to the inside, I used the twin needle for a nice finish. I also like the way the twin needle stitching echoes the double line of stitching for the underwire casing. 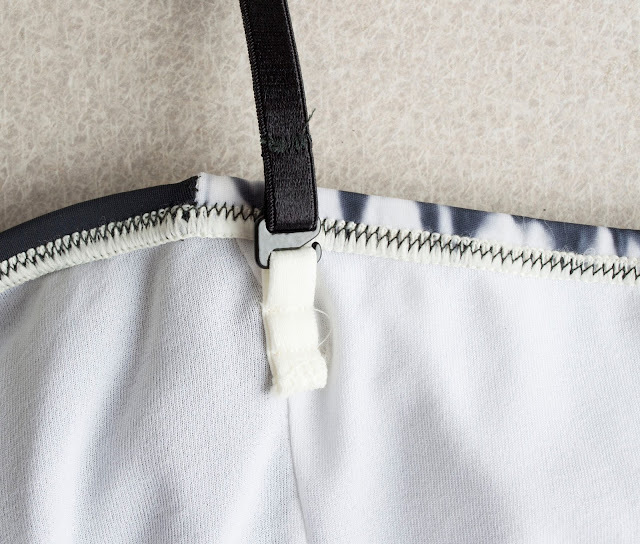 The strap loop on the back of the swimsuit, made with white plush bra strapping elastic. The fussiest part of the whole swimsuit was the straps! My biggest problem was with the little fabric loops that you are supposed to sew in for the strap hooks. The first time I made the fabric loops with the specified 3/8 inch seam allowance, they were too narrow (1/4 inch rather than 3/8) and too fat, and they were really hard to get onto the hooks and slid around annoyingly when I did get them on. You can see the loop that I made for the hook with black plush bra strapping elastic. So I tried again, sewing with a 1/4 inch seam allowance, and the loops were the right width but still really hard to get onto my hooks, which have a really narrow opening. I had visions of myself at the beach, struggling with the stupid hooks... not how I want to spend my beach time! I nearly just did away with them altogether since they are sort of unnecessary, but then I had the brilliant idea to use a little piece of 3/8" bra strapping. Problem solved! They hooks are made to be used for bra strapping, anyway. Adjustable swimsuit straps... the front is a lycra and swimsuit elastic strap, the adjustable part is plush bra strap elastic. They are joined with a ring, and the adjustable part has a slider. I also was worried that the straps would stretch out during wear, so I added an adjustable section using bra strapping and a slider in the back, attached to the main strap with a ring. I love the method of making elasticized straps shown in the pattern-- I'm totally using this technique on other swimsuits and camis. 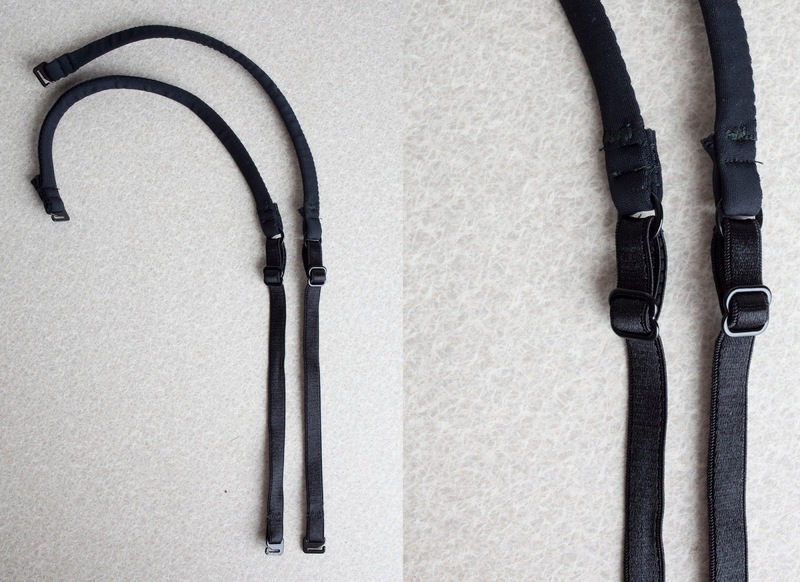 But the straps turned out too bulky to fit through the hook hardware easily. Having no other option (other than abandoning the hooks) I just worked at it until I was able to force the fat strap through the narrow hole. 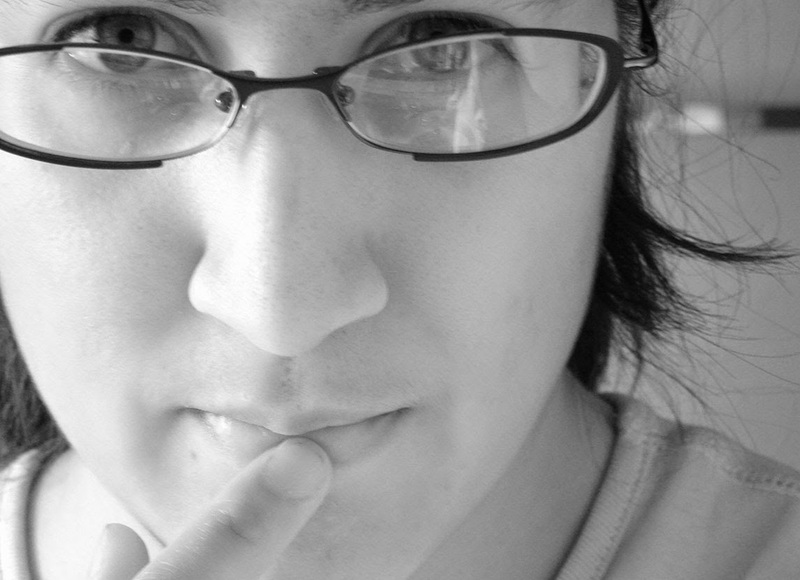 These problems are probably due to the hooks I ended up finding and using. They are Sew Sassy's nylon-coated metal 3/8 inch hooks, and they were the only ones I found in stock anywhere. 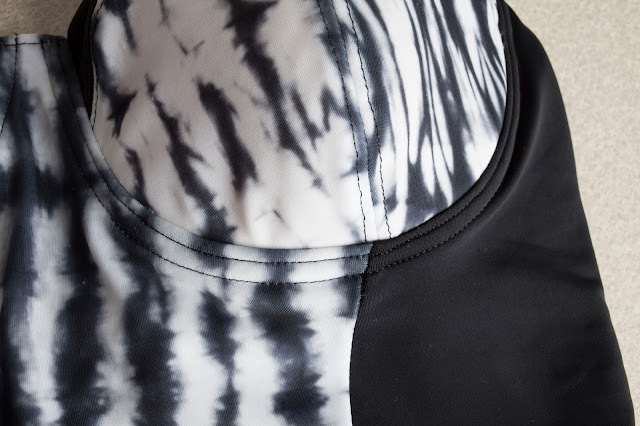 Another possible cause is the thickness of my lycra (the black milliskin is the thickest swimsuit lycra I've found) or my elastic (Sew Sassy's natural swimsuit elastic). I wonder if using rubber elastic might help with the thickness problem? If I make another Sophie, I'm probably not going to go through all this rigamarole with the straps. The fact is, I NEVER remove my straps... I don't care in the least if I get tan lines or anything like that. You might think, why how nice it is to be able to cross or uncross the straps, but I will ALWAYS wear they crossed-- I have the world's most sloped shoulders, and straps never stay up for me unless they are crossed. 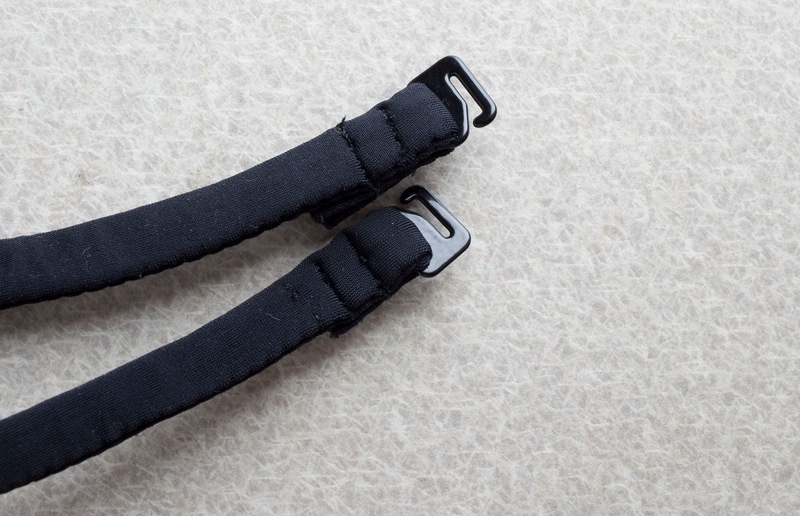 Even so, I still think it is super cool to have adjustable, removable straps... go figure. The fit is... pretty darn spot on. I might add a bit of length on the outer thigh... I think it would be a touch more flattering just a bit lower there. I also see what Heather says about the full body suit as being less supportive than the bikini top-- the underwires ride a little away from my chest wall without the support of a full bra band. Overall though, I couldn't be more pleased. The suit feels supportive, comfortable, and looks great! So, a bit about the materials and cost. Since you are basically engaging in bra-making, the Sophie (with the underwired cup option) requires quite a few specialty notions. Closet Case Files thoughtfully provides kits (which are sold out! ), but I was hoping to make mine a little more cheaply and was interested in adding to my bra-making stash, so I decided to forego the easy option. I really wanted to use the right underwires, so I went to Bra-Makers Supply, as instructed, which sends their US customers to Sweet Cups Bra Supply. I plugged in my order there, then freaked out at the shipping cost and went in search of other options. I actually just revisited their site and read their shipping policy... and they say that shipping calculations are often high and they will refund shipping if it can be sent more cheaply. They also will send orders under $30 via First Class if possible, if you put that in a comment. This info is even on a banner on their site right now... maybe I'm not the only one that missed that info. Well, that would have been nice to know, I'll keep them in mind for next time! But, the shipping cost freak out happened, so I did a little more research and landed at the Tailor Made online shop. I did a quick check-- and yes, shipping costs were quite reasonable. In addition, they sell underwires that look just like the ones at Bra-Makers Supply, so I ended up purchasing my wires here. I also bought bra lining fabric to use to line the bridge and to finish the cup seams. But they didn't have any 3/8 inch hooks of the sort required for the removable straps, so I ended up having to place a second order to Sew Sassy. Since I was interested in gearing up for more bra making, I used the opportunity to stock up on some different underwires, elastics, and notions. Overall, not cheap, but probably cheaper than buying a quality swimsuit, which would be anywhere from $70-$200. Also, probably a bit cheaper than buying a kit, but the kits come out to a pretty good deal, especially if you aren't interested in shopping in multiple online stores to get what you need! But I am also happy to have lots left over of just about everything... which will equal more swimsuits and bras sewn just from stashed items. In fact, while I was waiting for things to arrive, I made a muslin for a bra-- my first ever. It just so happens to be a foam cup balconette bra, just like the Sophie (the Makebra DL03) If the Sophie gets me past the bra-making hump, then that is a truly incredible outcome.